A woman who allegedly threw food at other passengers on a London to Birmingham train was beaten up along with her partner. All those involved in the fight are believed to have been on their way home from the Notting Hill Carnival which was held at the weekend. The woman accused the alleged sandwich thrower, telling her ‘don’t make me take off my wig’ and ‘I will punch you into next week’. Other passengers initially ignore what’s going on with some moving to other parts of the train before one of them eventually steps in to break up the fight. 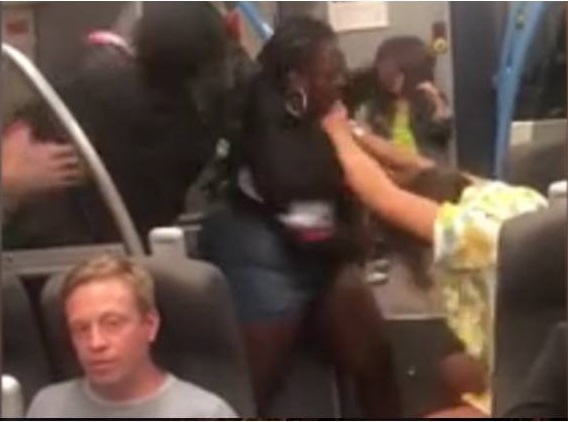 A spokesman for British Transport Police said: ‘We are aware of footage circulating on social media showing an assault on board a Chiltern Train. ‘We believe it relates to an incident which took place on a train between London and Birmingham Snow Hill at 9.50pm on 27 August. ‘An investigation into this incident is underway, no arrests have been made at this time.